sailboat. 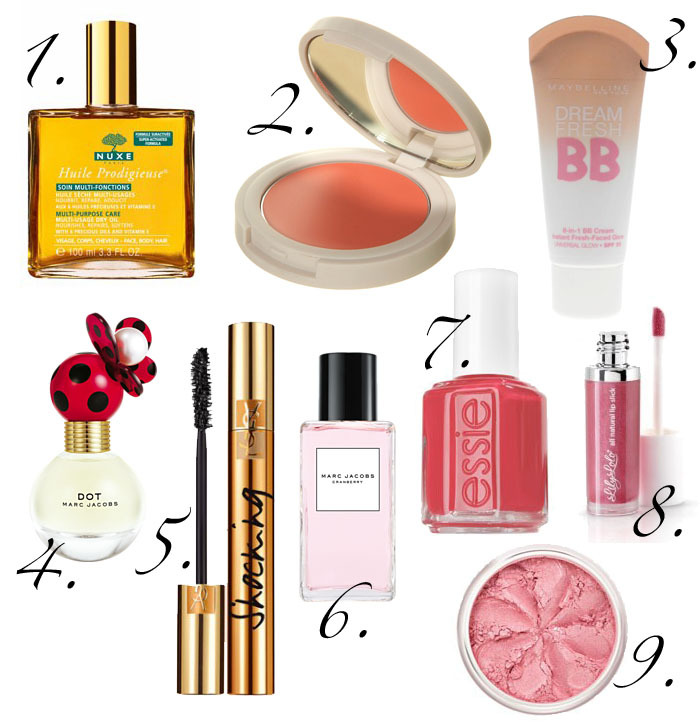 : Beauty Wish List. Most of the time I'm quite content with my make up 'collection' but other times, like now, I find myself lusting over a whole host of beauty items that I would love to add to my stash. I have no idea why, I have more than enough products, but companies just keep making more and more lovely things. I want all of the lovely things! 1. NUXE MULTI USE DRY OIL. I have a sample of the NUXE Multi Use Dry Oil that I received in a GlossyBox and I have fallen head over heels in love with it. I've been using it on my face as sort of a night treatment, I've been running a tiny bit through the ends of my hair before blow drying & I've been mixing a few drops in with my foundation in the mornings. I love love love this stuff and need the full size in my life as soon as possible! 2. TOPSHOP HEAD OVER HEELS CREAM BLUSH. Peachy toned blushers look stunning with Benefit Hoola bronzer that I've been wearing every single day, the combination is just a match made in heaven. I think Topshop Head Over Heels cream blush will be super similar to MAC Something Special, which I do already own, but I keep finding myself being drawn to this Topshop one too. I love Topshop cream blushers, for a bargainous price, the quality is beautiful! 3. MAYBELLINE DREAM FRESH BB CREAM. I had a few samples of the Maybelline Dream Fresh BB Cream and I fell in love with it almost instantly. It feels like nothing on the skin, super light and it just evens out my skin tone without looking too much. The lightest shade is ever so slightly too dark for me but it sheers out enough so it's not overly noticeable. I'm all about the light foundations/tinted moisturisers right now, I love that I can't feel them on my skin and with a bit of extra concealer, I've been using Bourjois Healthy Mix concealer, they're perfect! 4. MARC JACOBS DOT PERFUME. I'm sure almost everyone has headed to their nearest department store to give the newest fragrance, Dot by Marc Jacobs a sniff. I think it's absolutely beautiful, fresh, sweet and fruity all at the same time and the bottle is stunning! I have been hearing lots of good things about the YSL Shocking mascara recently and having never tried a YSL mascara before, I'm really intrigued! I'm always lusting over long, voluminous lashes that this mascara seems to promise but I'm not sure I could bring myself to spend almost £20 on something I'll have to throw away after 3 months! I know, another scent, but the Marc Jacobs Cranberry fragrance really is heavenly. The bottle is super sophisticated and would look gorgeous on my dressing table. This scent will always remind me of the summer and I would absolutely love to add this to my perfume collection! 7. ESSIE CUTE AS A BUTTON NAIL POLISH. Since growing my nails I've been eying up super cute nail polish shades and Cute As A Button from Essie keeps catching my eye! I'm slowly learning which shades suit my skin tone and at the moment I'm only really loving pink/coral/blue shades on my nails for some reason! 8. LILY LOLO LIP GLOSS. I adore Lily Lolo products but I've never tried one of their lipglosses before and all of the shades look so pretty, especially English Rose, Scandalips and Whisper! I love that Lily Lolo products are super natural and these glosses have added Vitamin E for moisturisation. 9. LILY LOLO MINERAL BLUSH. I had a Lily Lolo Mineral Blush a few years ago and it was gorgeous. They're so finely milled and the shades are all super pretty. I would love to add Candy Girl to my blush collection and I've just noticed they have a new shade called Beach Babe that looks stunning! Gosh, that was a long post. More of a little reminder to myself really, I don't want to accidentally forget about any of these products and if I find myself lusting over them in a few months time then I'll allow myself to make a sneaky purchase or two! Are you lusting after any beauty items at the moment? Have you tried any of these before? I'd love to know your opinions! I'm a little pale to use BB Creams - haven't found one that works for me yet but I'd definitely like to have one in my arsenal although the Lily Lolo Porcelain I bought back in May is working great, I don't wear it daily but do whip it out for those special occasions. Love the way I can achieve super light coverage with it - super pleased with it for a first venture into foundation! I really wanna try out Dot! This week my boyfriend promised me a gift and I am having to choose between one article of clothing or a couple of beauty supplies from Sephora. This gave me some good ideas! haha thanks! I need Dot in my life...it smells uh-mazing! I got samples of the BB cream as well but i'm scared to try it because it's in a light shade so i'm not sure how it'll match my skin. May just bite the bullet and do it! Lol! I have the head over heels blush and I love it!!! It's so gorgeous. I have the Maybelline BB cream and I'm in love with it. Maybelline base products have always worked really well for my skin and I keep going back to their dream foundation. I have Cute as a Button, it's lovely for summer so you should buy it quickly! I love the results of the YSL mascara but I always find it dries up really quickly so you don't even get 3 months out of it, and it is such a hefty price tag! The Topshop blushers are always lovely, but I need to stop buying make up products - far too many! still have my maybelline bb cream samples to try, am in love with my garnier one though! would definitely recommend it! I love the Nuxe dry oil too. I use it on my hair before drying it and it makes it soo soft. I love knowing that it's actually doing good for my hair as well instead of being full of silicones! I like number 2 and number 9. Great cosmetics choice, I'm lusting after Marc Jacobs Dot perfume too! Can definitely recommend the YSL shocking mascara, it's fab. Hopefully getting the Marc Jacobs Dot perfume next weekend for my birthday next week! Yayy! !